The Drexel University wrestling team started the season with victories against Shippensburg University and Garner-Webb University at North Penn High School Nov. 5. The Dragons got things started with a dominant 50-0 clean sweep of the Shippensburg Raiders. Junior Tanner Shoap set the pace for Drexel forcing a technical fall against his Shippensburg opponent, David Reagan, in the 125-pound fight. Shoap’s victory gave the Dragons an early 6-0 lead over the Raiders. Senior Kevin Devoy Jr. followed up pinning his opponent in the 133-pound fight, and Senior David Pearce won the 141-pound fight by a score of 6-4. 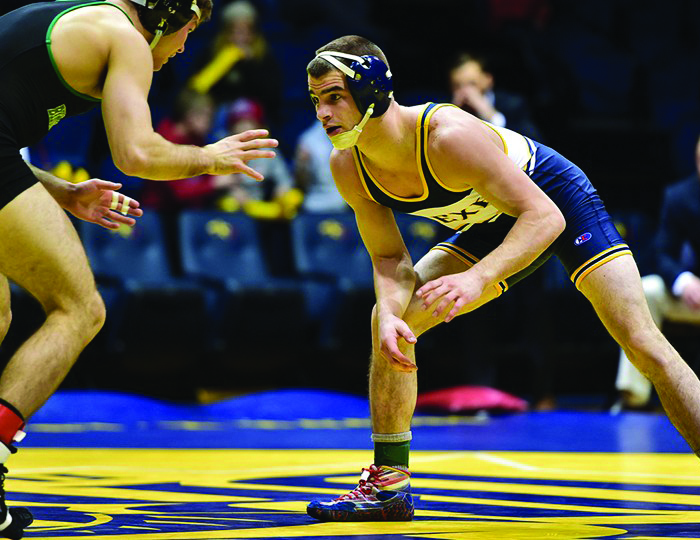 Senior Matthew Cimato and graduate student Garett Hammond pinned their opponents in the 149-pound fight and the 157-pound fight respectively. After junior Austin Rose won by injury default in the 165-pound fight, junior Nick Elmer picked up a 17-2 victory by way of a technical fall in the 174-pound fight. With an already commanding lead, junior Alex DeCiantis won by an 8-5 decision in the 184-pound fight and junior Joshua Murphy earned a 10-2 major decision in the 197-pound fight. Junior Joey Goodhart finished Drexel’s sweep of Shippensburg with a victory by pinning Shaheed Hill in the heavyweight match. The Dragons followed up their victory over the Raiders with a 23-15 win over the Garner-Webb Runnin’ Bulldogs. Shoap and Devoy Jr. once again gave the Dragons an early lead. Shoap earned a victory by fall and Devoy Jr. picked up an 11-3 major decision to open the score at 10-0 in favor of Drexel. Pearce was unable to continue Drexel’s dominance as he lost a close 4-3 decision with Garner-Webb’s Ryan Hull in the 141-pound fight, marking the first time of the evening that a Dragon lost a match. Following Cimatto’s 4-2 victory in the 149-pound match, Hammond lost to Garner-Webb’s Ryan Mosley on injury decision in the 157-pound division and the Bulldogs cut the Dragons’ lead to 13-9. Rose came up clutch for Drexel with a 2-0 decision in the 165-pound match with Kyle Ash, which pushed Drexel’s lead to 16-9. After Elmer and DeCiantis lost decisions in the 174-pound and 184-pound matches, respectively, the Dragons found themselves only one point ahead of Garner-Webb. Murphy delivered with an important 14-6 major decision in the 197-pound match to extend the Dragons’ lead to five. Joey Goodhart sealed the deal for the Dragons with a 5-0 decision in the heavyweight bout, making the final score 23-15 in favor of Drexel. Next up for the Dragons is a match with Sacred Heart University on Nov. 11 in Fairfield, Connecticut. It will be Drexel’s first match this season against a fellow Eastern Intercollegiate Association Wrestling Association team.